Ginepro Verde è una casa vacanza situata nella costa nord della Sardegna, nella località turistica Costa Paradiso. Situata in posizione panoramica, offre una fantastica vista sul mare, specialmente dalla zona della piscina. La struttura è composta da un luminoso e accogliente soggiorno, cucina completamente attrezzata, una camera da letto con letto matrimoniale, una camera con due letti singoli e un bagno con doccia. Dal soggiorno si accede all’ampia terrazza coperta, provvista di barbecue e tavolo esterno, per pranzi e cene all’aperto. Di fronte alla terrazza si trovano le due comode piscine, condivise da quattro unità. Le caratteristiche calette rocciose Li Sorgenti e Le Baiette si trovano a soli 450 metri dalla proprietà, mentre la stupenda spiaggia Li Cossi è si trova a 1500 metri e può essere raggiunta tramite un sentiero immerso nella natura. L’aeroporto e porto più vicini si trovano nella città di Olbia, a 85 km. L’aeroporto di Alghero dista 95 km. - Biancheria (asciugamani e lenzuola): 15 euro a persona (da prenotare in anticipo). Very nice villa surrounded by rocky nature! I spent only 2 nights in this nice holiday house with my family (me, my wife, my little child and our dog) and some friends. Since I made my reservation I have been contacted by the agency Sardinia Unlimited to have all the information we should needed and then on our arrival we welcomed by an other member of the agency's staff who gave us useful information for our stay. Very good service! 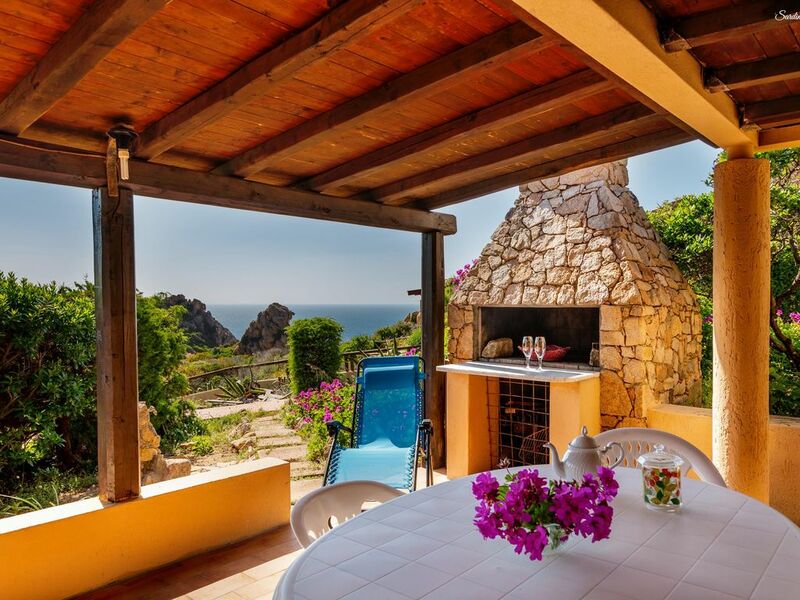 The villa is in good condition, as it appears on Homeaway. You will find everything you need. It has no air conditioning but the exposure and the layout of the rooms make it a very cool apartment. There is also a spacious and shaded terrace on a green Mediterranean vegetation, with a sea clove in the background where you could eat (there is also a barbecue) or simply relax yourselves. Our child was very happy for the pool who was just in front of the terrace, so that we could keep a watch on him. It's a real shame that we stayed for such a short time!!! We will come back! Dear Luc, thank you for the review. We hope to have you as our guest for your next holiday in Sardinia! Greetings from Sardinia! Ein komfortabler Ort, wo Sie Ihren Urlaub verbringen können!! Nur 2 Nächte, aber eine sehr schöne Erfahrung! Glücklicherweise fanden wir sehr schönes Wetter, obwohl es Oktober war und so hatten wir die Möglichkeit, auch zum Strand Li Cossi zu gehen, dem nächsten Sandstrand in Costa Paradiso. Ein sehr schöner Strand, der an diesen Tagen fast Wüste war! Die Villa war wie erwartet! Gut gepflegt und gereinigt! Wir waren 5 Leute und wir waren komfortabel. Von der Villa aus genießt man einen fantastischen Ausblick! Das Personal von Sardinia Unlimited, das uns während unseres kurzen Aufenthaltes willkommen geheißen hat, war sehr freundlich und professionell. Wir werden auf jeden Fall wiederkommen und dich sehen! Danke für alles. Wir sehen uns nächstes Jahr! Lieber Thomas, vielen Dank für Ihre Bewertung! Wir hoffen, Sie als unseren Gast für Ihren nächsten Urlaub auf Sardinien zu haben! Graziosa villetta a Costa Paradiso. Anche se siamo stati solo una notte consigliamo a tutti! Staff cortese e ottima pulizia. Abbiamo usato la piscina solamente un paio d'ore ma son servite per rigenerarci per proseguire il nostro itinerario in Sardegna. Costa Paradiso: a lovely place! This villa, Ginepro Verde, has hosted us for 4 days which we will remember with great pleasure. Holiday home very well maintained and cared for. Surrounded by greenery and in a privileged position, very panoramic. In these days we turned a bit and also visited other beautiful places. We have been in Castelsardo, in Santa Teresa di Gallura and even up to Alghero. Sardinia is always beautiful even in autumn! Sardinia Unlimited is the agency with which we booked and welcomed us in a friendly way. We were very happy. Thanks for everything! Die Unterkunft ist sauber und ausreichend. Einziger Mangel war ein nicht vorhandener Föhn bzw. zu wenig Geschirr ( Tassen für Kaffee ) ansonsten waren wir sehr zufrieden und würden jederzeit dort wieder Urlaub verbringen.